Download "ORIGINAL ARTICLE. Supporting information may be found in the online version of this article." 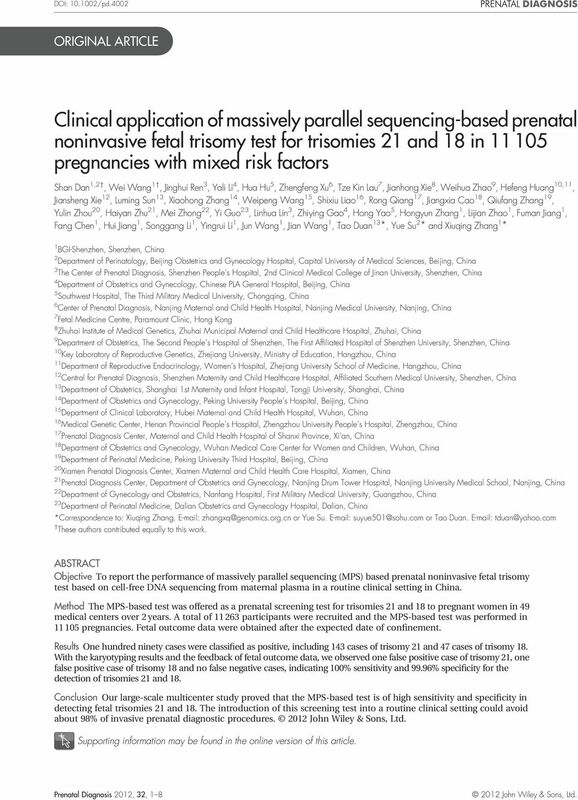 1 DOI: /pd.4002 ORIGINAL ARTICLE Clinical application of massively parallel sequencing-based prenatal noninvasive fetal trisomy test for trisomies 21 and 18 in pregnancies with mixed risk factors Shan Dan 1,2,WeiWang 1, Jinghui Ren 3,YaliLi 4,HuaHu 5, Zhengfeng Xu 6,TzeKinLau 7,JianhongXie 8,WeihuaZhao 9,HefengHuang 10,11, Jiansheng Xie 12,LumingSun 13, Xiaohong Zhang 14,WeipengWang 15, Shixiu Liao 16,RongQiang 17,JiangxiaCao 18, Qiufang Zhang 19, Yulin Zhou 20, Haiyan Zhu 21, Mei Zhong 22,YiGuo 23, Linhua Lin 3, Zhiying Gao 4,HongYao 5, Hongyun Zhang 1, Lijian Zhao 1,FumanJiang 1, Fang Chen 1,HuiJiang 1, Songgang Li 1,YingruiLi 1,JunWang 1,JianWang 1, Tao Duan 13 *,YueSu 2 * and Xiuqing Zhang 1 * 1 BGI-Shenzhen, Shenzhen, China 2 Department of Perinatology, Beijing Obstetrics and Gynecology Hospital, Capital University of Medical Sciences, Beijing, China 3 The Center of Prenatal Diagnosis, Shenzhen People s Hospital, 2nd Clinical Medical College of Jinan University, Shenzhen, China 4 Department of Obstetrics and Gynecology, Chinese PLA General Hospital, Beijing, China 5 Southwest Hospital, The Third Military Medical University, Chongqing, China 6 Center of Prenatal Diagnosis, Nanjing Maternal and Child Health Hospital, Nanjing Medical University, Nanjing, China 7 Fetal Medicine Centre, Paramount Clinic, Hong Kong 8 Zhuhai Institute of Medical Genetics, Zhuhai Municipal Maternal and Child Healthcare Hospital, Zhuhai, China 9 Department of Obstetrics, The Second People s Hospital of Shenzhen, The First Affiliated Hospital of Shenzhen University, Shenzhen, China 10 Key Laboratory of Reproductive Genetics, Zhejiang University, Ministry of Education, Hangzhou, China 11 Department of Reproductive Endocrinology, Women s Hospital, Zhejiang University School of Medicine, Hangzhou, China 12 Central for Prenatal Diagnosis, Shenzhen Maternity and Child Healthcare Hospital, Affiliated Southern Medical University, Shenzhen, China 13 Department of Obstetrics, Shanghai 1st Maternity and Infant Hospital, Tongji University, Shanghai, China 14 Department of Obstetrics and Gynecology, Peking University People s Hospital, Beijing, China 15 Department of Clinical Laboratory, Hubei Maternal and Child Health Hospital, Wuhan, China 16 Medical Genetic Center, Henan Provincial People s Hospital, Zhengzhou University People s Hospital, Zhengzhou, China 17 Prenatal Diagnosis Center, Maternal and Child Health Hospital of Shanxi Province, Xi an, China 18 Department of Obstetrics and Gynecology, Wuhan Medical Care Center for Women and Children, Wuhan, China 19 Department of Perinatal Medicine, Peking University Third Hospital, Beijing, China 20 Xiamen Prenatal Diagnosis Center, Xiamen Maternal and Child Health Care Hospital, Xiamen, China 21 Prenatal Diagnosis Center, Department of Obstetrics and Gynecology, Nanjing Drum Tower Hospital, Nanjing University Medical School, Nanjing, China 22 Department of Gynecology and Obstetrics, Nanfang Hospital, First Military Medical University, Guangzhou, China 23 Department of Perinatal Medicine, Dalian Obstetrics and Gynecology Hospital, Dalian, China *Correspondence to: Xiuqing Zhang. or Yue Su. or Tao Duan. These authors contributed equally to this work. 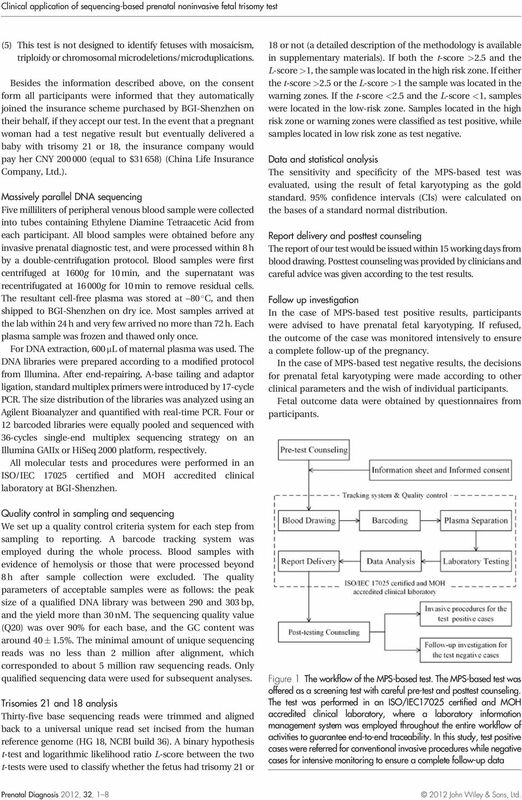 ABSTRACT Objective To report the performance of massively parallel sequencing (MPS) based prenatal noninvasive fetal trisomy test based on cell-free DNA sequencing from maternal plasma in a routine clinical setting in China. 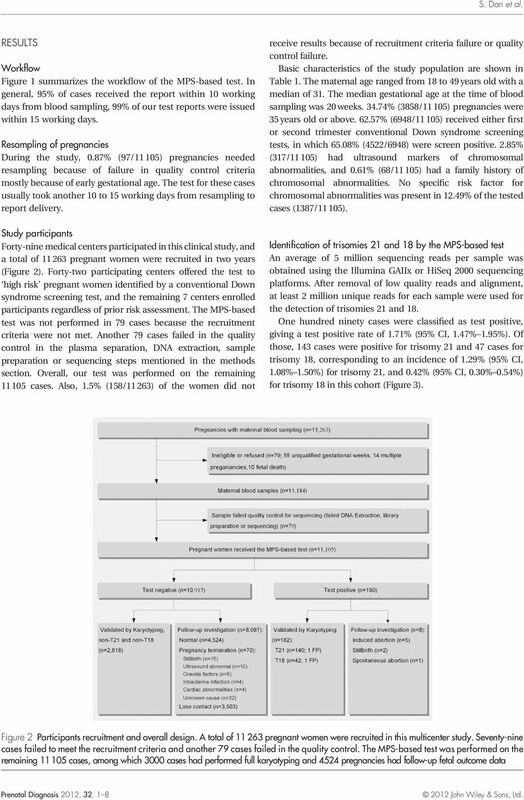 Method The MPS-based test was offered as a prenatal screening test for trisomies 21 and 18 to pregnant women in 49 medical centers over 2 years. A total of participants were recruited and the MPS-based test was performed in pregnancies. Fetal outcome data were obtained after the expected date of confinement. Results One hundred ninety cases were classified as positive, including 143 cases of trisomy 21 and 47 cases of trisomy 18. With the karyotyping results and the feedback of fetal outcome data,we observed one false positive case of trisomy 21,one false positive case of trisomy 18 and no false negative cases, indicating 100% sensitivity and 99.96% specificity for the detection of trisomies 21 and 18. Conclusion Our large-scale multicenter study proved that the MPS-based test is of high sensitivity and specificity in detecting fetal trisomies 21 and 18. The introduction of this screening test into a routine clinical setting could avoid about 98% of invasive prenatal diagnostic procedures. Supporting information may be found in the online version of this article. 2 S. Dan et al. Funding sources: The study was funded by Shenzhen Birth Defect Screening Project Lab (JZF No. 861) approved by Shenzhen Municipal Commission for Development and Reform and Key Laboratory Project in Shenzhen (CXB A and CXB A) and Key Laboratory of Cooperation Project in Guangdong Province (2011A ). Conflicts of interest: Wei Wang, Hongyun Zhang, Lijian Zhao, Fuman Jiang, Fang Chen, Hui Jiang, Songgang Li, Yingrui Li, Jun Wang, Jian Wang, Xiuqing Zhang are employees of BGI-Shenzhen and none of the other authors have any financial relationship with BGI-Shenzhen. INTRODUCTION Each year there are about 16 million newborns in China, of whom 4% to 6% are affected by some form of birth defects. 1,2 Chromosomal abnormalities, with an incidence of 1 in 160 births, are one of the most important causes of birth defects, and there are no curative treatments at present. 3 Although invasive prenatal tests allow accurate diagnosis, wide spread clinical use is limited by cost and a 0.5% to 1% risk of procedure-related miscarriage. 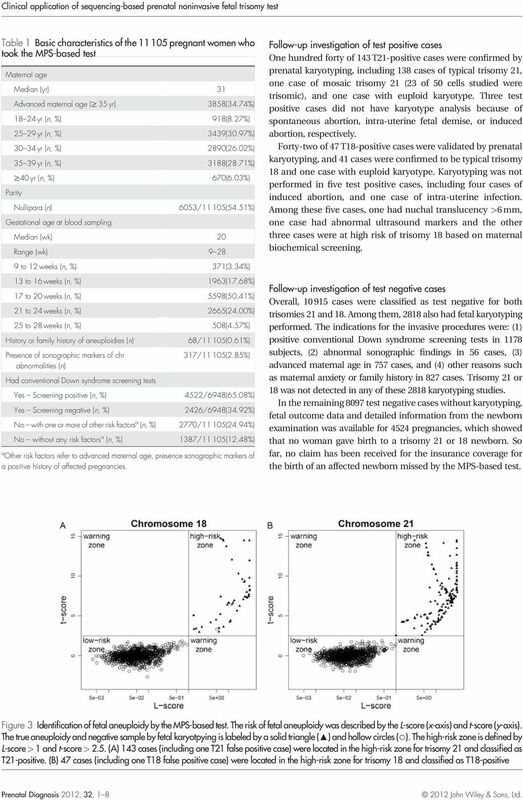 4 6 Over the last three decades, many screening tests have been developed to identify the highrisk groups for the most common chromosomal abnormalities, such as trisomy 21 (T21), 18 (T18) and 13 (T13), by various combinations of medical history, maternal age, ultrasound markers and maternal serum biochemistry. To date the first trimester combined screening has become widely accepted, being able to detect about 90% of trisomy 21 fetuses and 50% to 85% of other chromosomal defects. 7,8 However, at a false positive rate of 4% to 5% for current screening approaches, only about 5% of the high-risk pregnant women indeed carry a fetus with trisomy 21 while the remaining are normal, giving a positive predictive value of about 1 in 20. 9,10 Therefore, there is a continuous drive to search for a diagnostic test without risk of miscarriage, or a screening test with better performance. A variety of strategies have been explored using maternal blood, urine, and saliva samples to diagnose fetal gender and trisomy ,12 The discovery of the presence of fetal cell-free DNA and RNA in maternal plasma, combined with PCR technologies and mass spectrometric analysis, has enabled noninvasive detection of trisomies 21 and 18 with acceptable sensitivity and specificity However, these methods mainly detect specific alleles in a certain population, which has restricted its wide and robust application in clinical practice. In 2008 the rapid development of massively parallel sequencing (MPS) technology made it feasible to use maternal plasma cellfree DNA to detect trisomy 21 without using polymorphic markers. 18,19 Studies from multiple centers so far have shown that this is a highly reliable approach with a detection rate of 99% to 100% and a specificity of 98% to 100% for trisomy More recent studies have suggested that, with improved bioinformatic analysis, similar accuracies are achievable for the detection of trisomies 18 and Several research groups have published their clinical trial data with 397 to 4664 cases. 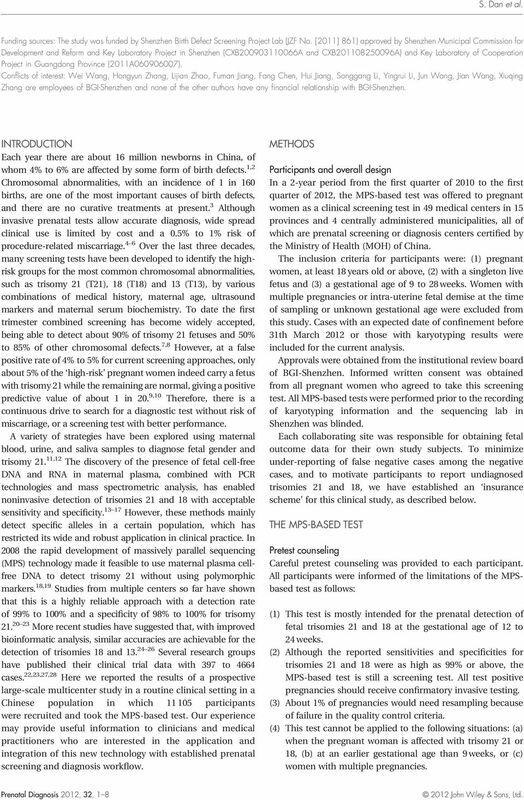 22,23,27,28 Here we reported the results of a prospective large-scale multicenter study in a routine clinical setting in a Chinese population in which participants were recruited and took the MPS-based test. Our experience may provide useful information to clinicians and medical practitioners who are interested in the application and integration of this new technology with established prenatal screening and diagnosis workflow. METHODS Participants and overall design In a 2-year period from the first quarter of 2010 to the first quarter of 2012, the MPS-based test was offered to pregnant women as a clinical screening test in 49 medical centers in 15 provinces and 4 centrally administered municipalities, all of which are prenatal screening or diagnosis centers certified by the Ministry of Health (MOH) of China. The inclusion criteria for participants were: (1) pregnant women, at least 18 years old or above, (2) with a singleton live fetus and (3) a gestational age of 9 to 28 weeks. Women with multiple pregnancies or intra-uterine fetal demise at the time of sampling or unknown gestational age were excluded from this study. Cases with an expected date of confinement before 31th March 2012 or those with karyotyping results were included for the current analysis. Approvals were obtained from the institutional review board of BGI-Shenzhen. Informed written consent was obtained from all pregnant women who agreed to take this screening test. All MPS-based tests were performed prior to the recording of karyotyping information and the sequencing lab in Shenzhen was blinded. Each collaborating site was responsible for obtaining fetal outcome data for their own study subjects. To minimize under-reporting of false negative cases among the negative cases, and to motivate participants to report undiagnosed trisomies 21 and 18, we have established an insurance scheme for this clinical study, as described below. THE MPS-BASED TEST Pretest counseling Careful pretest counseling was provided to each participant. All participants were informed of the limitations of the MPSbased test as follows: (1) This test is mostly intended for the prenatal detection of fetal trisomies 21 and 18 at the gestational age of 12 to 24 weeks. (2) Although the reported sensitivities and specificities for trisomies 21 and 18 were as high as 99% or above, the MPS-based test is still a screening test. All test positive pregnancies should receive confirmatory invasive testing. (3) About 1% of pregnancies would need resampling because of failure in the quality control criteria. (4) This test cannot be applied to the following situations: (a) when the pregnant woman is affected with trisomy 21 or 18, (b) at an earlier gestational age than 9 weeks, or (c) women with multiple pregnancies. 8 S. Dan et al. 13. Lo YM, Lun FM, Chan KC, et al. Digital PCR for the molecular detection of fetal chromosomal aneuploidy. Proc Natl Acad Sci U S A 2007;104: Tsui NB, Chiu RW, Ding C, et al. Detection of trisomy 21 by quantitative mass spectrometric analysis of single-nucleotide polymorphisms. Clin Chem 2005;51: Tong YK, Ding C, Chiu RW, et al. Noninvasive prenatal detection of fetal trisomy 18 by epigenetic allelic ratio analysis in maternal plasma: Theoretical and empirical considerations. Clin Chem 2006;52: Lo YM, Tsui NB, Chiu RW, et al. Plasma placental RNA allelic ratio permits noninvasive prenatal chromosomal aneuploidy detection. Nat Med 2007;13: Papageorgiou EA, Karagrigoriou A, Tsaliki E, et al. Fetal-specific DNA methylation ratio permits noninvasive prenatal diagnosis of trisomy 21. Nat Med 2011;17: Chiu RW, Chan KC, Gao Y, et al. Noninvasive prenatal diagnosis of fetal chromosomal aneuploidy by massively parallel genomic sequencing of DNA in maternal plasma. Proc Natl Acad Sci U S A 2008;105: Fan HC, Blumenfeld YJ, Chitkara U, et al. Noninvasive diagnosis of fetal aneuploidy by shotgun sequencing DNA from maternal blood. Proc Natl Acad Sci U S A 2008;105: Ehrich M, Deciu C, Zwiefelhofer T, et al. Noninvasive detection of fetal trisomy 21 by sequencing of DNA in maternal blood: a study in a clinical setting. 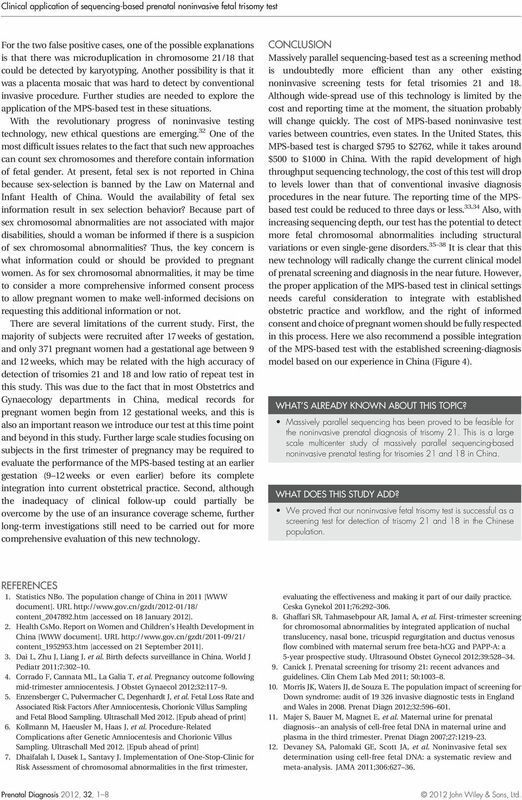 Am J Obstet Gynecol 2011;204:205 e Chiu RW, Akolekar R, Zheng YW, et al. Non-invasive prenatal assessment of trisomy 21 by multiplexed maternal plasma DNA sequencing: large scale validity study. BMJ 2011;342:c Palomaki GE, Kloza EM, Lambert-Messerlian GM, et al. DNA sequencing of maternal plasma to detect Down syndrome: an international clinical validation study. Genet Med 2011;13: Ashoor G, Syngelaki A, Wagner M, et al. Chromosome-selective sequencing of maternal plasma cell-free DNA for first-trimester detection of trisomy 21 and trisomy 18. 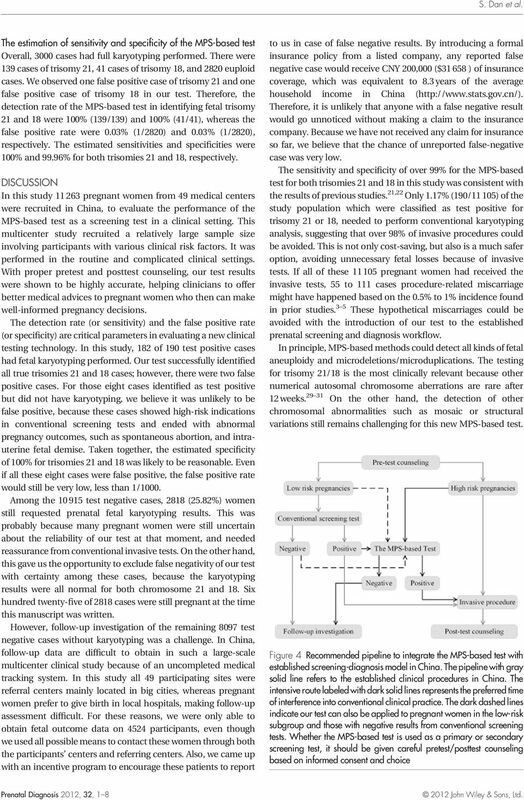 Am J Obstet Gynecol 2012;206:322 e Chen EZ, Chiu RW, Sun H, et al. Noninvasive prenatal diagnosis of fetal trisomy 18 and trisomy 13 by maternal plasma DNA sequencing. PLoS One 2011;6:e Lau TK, Chen F, Pan X, et al. Noninvasive prenatal diagnosis of common fetal chromosomal aneuploidies by maternal plasma DNA sequencing. J Matern Fetal Neonatal Med 2012;25: Palomaki GE, Deciu C, Kloza EM, et al. DNA sequencing of maternal plasma reliably identifies trisomy 18 and trisomy 13 as well as Down syndrome: an international collaborative study. Genet Med 2012;14: Lau TK, Chan MK, Salome Lo PS, et al. Clinical utility of noninvasive fetal trisomy (NIFTY) test - early experience. J Matern Fetal Neonatal Med 2012;25(10): Bianchi DW, Platt LD, Goldberg JD, et al. Genome-wide fetal aneuploidy detection by maternal plasma DNA sequencing. Obstet Gynecol 2012;119: Aboussair N, Jaouad IC, Dequaqui SC, et al. Cytogenetic analysis of 5572 patients referred for suspected chromosomal abnormalities in morocco. Genet Test Mol Biomarkers 2012;16: Mademont-Soler I, Morales C, Clusellas N, et al. Prenatal cytogenetic diagnosis in Spain: analysis and evaluation of the results obtained from amniotic fluid samples during the last decade. Eur J Obstet Gynecol Reprod Biol 2011;157: Leung TY, Chan LW, Leung TN, et al. First-trimester combined screening for trisomy 21 in a predominantly Chinese population. Ultrasound Obstet Gynecol 2007;29: Deans Z, Newson AJ. Ethical considerations for choosing between possible models for using NIPD for aneuploidy detection. J Med Ethics 2012;38(10): Phimister EG, Feero WG, Guttmacher AE. Realizing genomic medicine. N Engl J Med 2012;366: Rothberg JM, Hinz W, Rearick TM, et al. An integrated semiconductor device enabling non-optical genome sequencing. Nature 2011;475: Jensen TJ, Dzakula Z, Deciu C, et al. Detection of Microdeletion 22q11.2 in a Fetus by Next-Generation Sequencing of Maternal Plasma. Clin Chem 2012;58: Lo YM, Chan KC, Sun H, et al. Maternal plasma DNA sequencing reveals the genome-wide genetic and mutational profile of the fetus. Sci Transl Med 2010;2:61ra Kitzman JO, Snyder MW, Ventura M, et al. Noninvasive whole-genome sequencing of a human fetus. 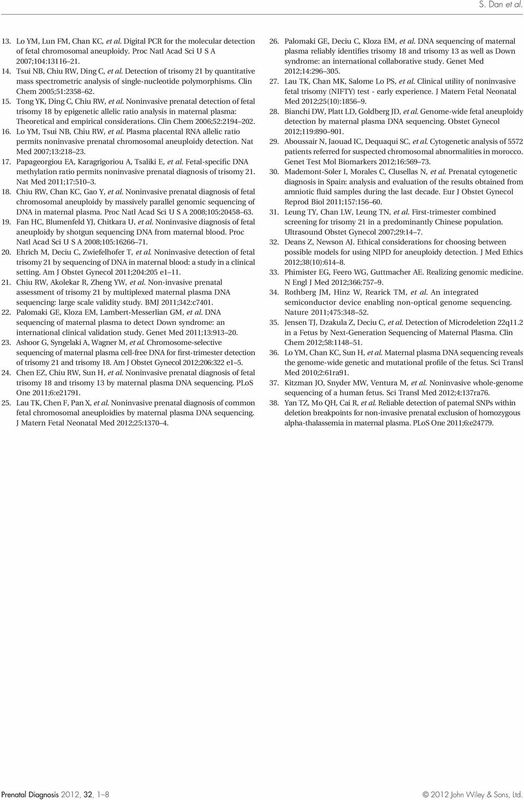 Sci Transl Med 2012;4:137ra Yan TZ, Mo QH, Cai R, et al. Reliable detection of paternal SNPs within deletion breakpoints for non-invasive prenatal exclusion of homozygous alpha-thalassemia in maternal plasma. PLoS One 2011;6:e24779.